Canton shopping, fishing, and golf...What more could you ask for? 3 bedrooms, 2 bathrooms with lake views of Lake Holbrook. Our home has 3 bedrooms and 2 bathrooms. The master bedroom has a queen bed with an attached bathroom. Our closet in the master is large enough to accommodate a pack and play or queen air mattress. We have used it as an additional bedroom on many occasions. The second bedroom has a queen bed as well. Lastly, the third bedroom has 2 twin beds. The second bathroom is located between the second and third bedrooms. We have a fully stocked kitchen waiting for you. If cooking isn't your favorite activity on vacation, no problem! We have many good restaurants nearby open for breakfast, lunch, and dinner. If you will be boating, the public ramp is located across the street. We also have a public beach that our kids love to explore. You will need to drive to the public beach for the safety of the swimmers. 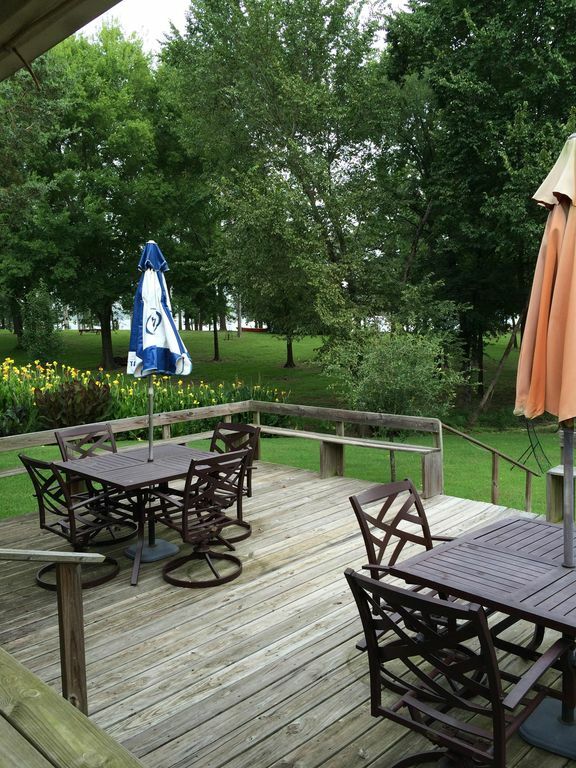 After your busy day of shopping, playing on the lake, fishing, golfing, or exploring nearby towns relax on the back porch with your favorite beverage. We have plenty of comfortable seating, a cozy hammock and a tv ...just in case that favorite show can't be missed. Hope you can come visit soon. Life is always better at the lake. We are a busy family of 5. We purchased this property to get away from the city, slow down and make memories with our family and friends. You will love the many opportunities available to have fun. Really there is something for everyone: antique shopping, playing on the lake and beach, fishing, golf, family adventures, dining, and winery tours. Downtown Minneola is a great location for shopping, dining, and watching a movie at the oldest movie house. A small public street seperates our property from Lake Holbrook. You can easily walk through the backyard and access the public boat ramp, dock or banks for fishing. A small public street seperates our property from Lake Holbrook. You can easily walk through the backyard to access the public boat ramp, dock or banks for fishing. We have a bar height table that sits 4 inside and also a game table inside that seats 4 as well. Outside there is ample seating- 3 sets of tables with chairs that seats 14. Public dock with easy access and parking. Bring your own boat or jet skis and enjoy the weekend on the water. Many golf courses in the area. Bring your own clubs. We enjoyed this clean, comfortable home with a great view of lake! Owner very nice! Enjoyed this little lake home. From sitting on the deck overlooking the lake to eating and shopping . Perfect place for us ladies to hang out and enjoy each other. House had everything we needed and is just as it is represented. House is very clean and comfortable. Great location over looking the lake. We had a great time catching large mouth bass at local lakes. Thanks again Kristi we had a wonderful time. Lovely home by the lake! We had to travel to Texas due a family emergency found this home 36 hours before leaving home. Kristi the owner was so helpful and kind to us. The house was very lovely and restful, giving us a place to relax and the well equipped kitchen made it easy to prepare food for my daughter and I who both have allergies. Hopefully we will be able to come back and stay for a happier and more relaxing stay in the future. great quiet escape for the weekend! We are located on Lake Holbrook. Cancellations must be received in writing 30 days prior to arrival date. Reservations made within 30 days of arrival are non refundable.